What is the Medial Collateral Ligament? The medial collateral ligament (MCL) is the ligament that is located on the inner part of the knee joint. It runs from the femur (thighbone) to the top of the tibia (shinbone) and helps in stabilizing the knee. Medial collateral ligament (MCL) injury can result in a stretch, partial tear, or complete tear of the ligament. 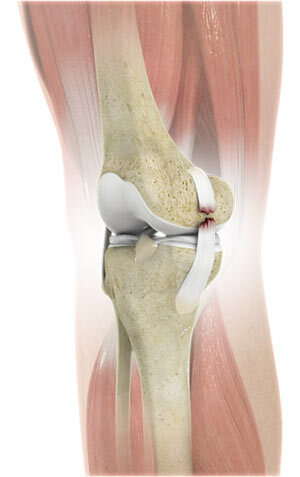 Injuries to the MCL commonly occur because of pressure or stress on the outside part of the knee. Anterior cruciate ligament (ACL) may be torn along with an MCL injury. Patients with an MCL tear have symptoms such as knee pain, swelling, and locking or catching sensation in the knee during movement. Patients may also feel as though their knee may 'give way’' suddenly or buckle. Your doctor will usually diagnose an MCL injury based on a physical examination of your knee. To determine looseness of the ligament, an MCL test may be performed by exerting pressure on the outside of your knee while your knee is bent to 25 degrees. In addition, other tests such as knee joint X-rays and MRI scan may be done. Treatment options include non-surgical and surgical treatment. Non-surgical treatment consists of rest, ice, compression, and elevation (RICE protocol); all assist in controlling pain and swelling. A knee brace may be worn to help immobilize your knee. Use of crutches may be recommended to protect your knee and to keep you from putting weight on your knee while walking. Physical therapy exercises may be recommended to improve knee motion and strength. Most often, surgery is not necessary for the treatment of an MCL tear. If needed, it is usually performed using arthroscopy. In many cases, this injury cannot be prevented. However, using proper techniques during sports or exercising can help prevent injury. The skeletally immature knee in a child slightly differs from the adult knee and may result in mild variations of injury patterns. In children, the epiphyseal plates (growth plates) are weak compared with ligaments in the adults. Growth plate, also called the epiphyseal plate or physis, is the area of growing tissue made up of cartilage (rubbery material) found at the ends of the long bones in children. Therefore, any extraneous force on the knee causes physeal injury rather than the ligament injury. Hence MCL injuries are less common in children. Most often, it occurs in teenage athletes who participate in sports, such as football and ice hockey. Younger children below the age of 12 years are less likely to injure their MCL, as the bone where the ligament attaches may break.